As a teenager, William was involved in an accident that resulted in an open skull wound and left him legally blind. This accident did not stop him from either completing high school or earning a BA in Political Science from Kenyon College. He began volunteering at CTD in 2003 and has since joined the staff. 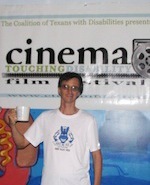 He founded the Cinema Touching Disability Film Festival in 2004 as a public awareness and fund raising project. The Festival has grown to include an international Short Film Competition, appearances by film stars and directors, and multiple nights of screenings. The competition now receives entries from around the globe. Contributing to CTD's advocacy work, William testifies before the city and state legislatures on accessible technology and voting. As a long distance runner, William established CTD's running team in 2009 to help demonstrate the athletic ability of people who have a disability. He completed the Boston Marathon, the oldest and most prestigious marathon in America, in April 2013 and 2018. Get the full story of Will's experience in Boston.